The name JioFi doesn’t need any introduction, it’s a portable 4G router / modem device which allows to connect multiple devices like 2G / 3G smartphones, tablets, laptops, Smart Led televisions etc simultaneously, to access all JIO’s 4G LTE services. In general, you can connect upto 10 different devices to the JioFi using the WiFi channel and 1 device using the USB tethering channel. JioFi is bundled with a 2300 mAh battery inside, which can lasts upto 8 hours to help you enjoy the Jio’s 4G data services on the go. Believe or not, JioFi is a must have gadget for every internet savvy individual. 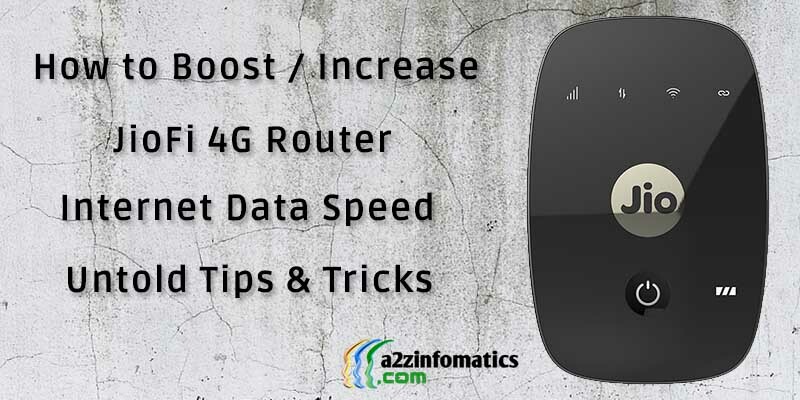 How to Boost / Increase JioFi 4G Router Internet Data Speed – Untold Tips & Tricks. Although, the majority of the JioFi users will never complain or feel any issue while connecting their devices with Jiofi to access the Jio 4G LTE services. Under some exceptional circumstances, few JioFi users may feel / have some issues related to the JioFi connectivity to other devices and slow 4G internet / data speed. No worries, today we are here with the same cause, about guiding you to solve basic JioFi issues / problems the users are experiencing. Type of the Internet Data Plan Subscribed with the Network Provider (Jio in this case). Signal Strength in your area. JioFi Device / Modem / 4G Router Configuration – Settings. Faulty JioFi Device / Modem / 4G Router. Distance between the JioFi and connected devices. Number of devices connected to the JioFi. You can’t rule out other unlisted factors that may effect the JioFi internet data speed, but 9 out of 10 times, the above listed factors would be the reason. Let’s now explore these main factors in detail and start experiencing the superfast 4G internet data using the JioFi. Why JioFi Jio Wifi Device 4G Data Speed is Slow / Low. 1)- Subscribed Jio Plan for the JioFi. Each and every Jio LTE 4G data plan comes with the rocket fast internet speed with 1Gb / 1.5Gb / 2Gb / 3Gb / 4Gb daily data usage limit. Once the daily usage limit is crossed (exhausted), the 4G internet data speed is reduced to 128 Kbps by default. Please check your JioFi data usage using the Jio Mobile App or by visiting the Official Jio Website. If this is the reason for slow 4G internet data speed on your JioFi, don’t panic, the rocket fast 4G internet speed will be restored once you enters the next day cycle (typically at 12:01 Am). 2)- Strength of the Jio Network Signals. This actually is the major factor that determine the 4G internet data speed on JioFi. As Jio Network is in its growing stage, there are very strong chances that the area you reside, is not getting the adequate Jio Network Signals for acceptable 4G internet speed. You can anytime check the Jio network signal strength on the JioFi display panel, refer the color codes listed below to calculate the exact Jio Network signals your JioFi device is receiving. Green Indication (Full Signal bars) – This means Excellent / Full Jio Network Signals. Blue Indication (2-4 Signal bars) – This means Good / Average Jio Network Signals. Red Indication (0-1 Signal bars) – This means No / Low / Bad Jio Network Signals. If anybody is effected with this factor, getting slow 4G internet data speed on the JioFi, try moving the JioFi device to the different places and check if any location is getting the excellent or good Jio Network Signals. Once the JioFi device falls under required network signals, you will experience the acceptable 4G internet data speed on your JioFi 4G router / WiFi device. 3)- Mis- Configuration of the JioFi Settings. JioFi works great with default factory settings. If you has altered any JioFi device setting manually, switch back to the default device setting and the things will get back to normal. For more details, do refer the JioFi device manual bundled with the JioFi box at the time of purchase. A person can easily sense if their JioFi device or the connected device is faulty. You have to replace the effected device accordingly to experience the rocket fast JioFi 4G Internet data speed. 5)- Distance Between the JioFi 4G Router and the Connected devices. Do you know, JioFi device has a limitation to transmit the data among devices, which falls within the 10-12 metre radius from the JioFi device. For the best 4G internet data speed, make it sure that the connected devices to the JioFi, lies within the 8-10 metre radius from the JioFi. 6)- Number of devices connected to the JioFi WiFi device. Technically, you can connect upto 10 multiple devices with the JioFi 4G WiFi router. You always have to understand that there is only 1 main internet data pipeline for the JioFi device with the Jio Network. In the whole operation, the 4G internet data is logically divided by the JioFi device among all connected devices. The more number of devices connected to the JioFi means the lesser amount of data each connected device will receive from the JioFi WiFi router. In simple words, to increase the JioFi 4G internet data speed, make a practice of only connecting 2-3 devices to the JioFi at a time. How to Increase / Boost JioFi 4G WiFi Internet Data Speed – The Untold Tips & Tricks. Below are some untold tips and tricks to increase / boost Reliance Jio’s JioFi 4G internet data speed to the maximum. You will definitely feel the difference, once you implement all recommendations listed below. Make it sure that the JioFi always lies within the recommended distance (8-10 metres) from all the connected device. In addition, there shouldn’t be any obstruction lying, between JioFi and the connected devices. Without proper Jio Network Signals, there is no chance of getting acceptable 4G internet data speed on JioFi. If you are not getting the recommended Jio network signals for the JioFi, keep moving the JioFi device to different corners and place the JioFi device to the place, where the availability of jio network signals is maximum. Don’t put unnecessary load on the JioFi 4G internet device, the more devices you connect to the JioFi, the lesser 4G internet data speed you will experience on the connected device. For best JioFi 4G internet data speed experience, make a practice to only connect 2-3 devices at a time to the JioFi. JioFi 4G router can only works with the Jio Network and you need an active Jio plan to receive the 4G rocket fast internet data. Every Jio plan is capped with a maximum daily 4G data usage limit with the full speed. Once the daily 4G usage limit is exhausted, the internet speed will automatically degrade to 128 Kbps. Keep checking the remaining 4G data usage limit using the Jio USSD Codes, avoid wasting your precious 4G internet data at useless stuff. In case you had exhausted the daily 4G data limit, you can anytime purchase Reliance Jio Data AddOn packs accordingly. If you are experiencing low 4G internet data connectivity with any specific mobile app or website, you can troubleshoot the problem by deleting the cache of the respective mobile app or website. If this doesn’t help, try re-installing the mobile app or the internet browser in the connected device. At last, but not the least, do confirm that the wireless security for the JioFi device is enabled all the time. If you haven’t protected the access to the JioFi 4G router with any strong password, other people can easily access the JioFi 4G internet data anonymously. This will put unwanted load on the JioFi device and the subscribed jio data plan, which in return will drop the JioFi 4G internet data speed available for the connected devices. That’s all we have in our basket about increasing JioFi 4G Router Internet Data Speed. We are sure that after reading and implementing all the listed tips and tricks about increasing / boosting the JioFi 4G internet speed, everybody will utilize the maximum JioFi 4G internet data speed. In case, anybody still experiencing low JioFi internet speed, contact Jio Customer Care for additional help.